As Police, Fire and Crime Commissioner it is Julia’s responsibility to set the police and fire precepts. The two services have distinct finances and funding. The precept raised for policing is used to fund the Police. Before Julia sets the precepts, she wants to hear your thoughts. 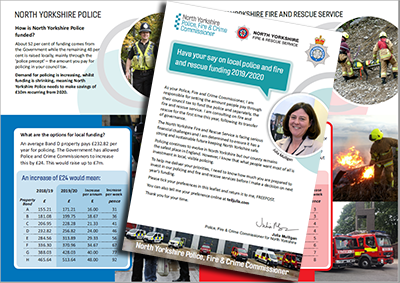 Please take a few moments to complete the survey and tell her how much you are prepared to pay next year for both the police, and fire service in North Yorkshire. Policing continues to evolve in North Yorkshire as it responds to the changing nature of crime and demands on our police service. This county remains the safest place in England, but we are facing a series of challenges with many people telling Julia they want to see investment in local, visible policing. Through public consultation, Julia has developed a list of priorities for the Chief Constable. These include increasing the number of officers, improving the 101 service and dealing with serious and local crime concerns. Our police service faces financial challenges and needs to save around £10m per year from 2020. An average Band D property currently pays £232.82 per year for policing. The Government allows Police, Fire and Crime Commissioners to increase the police precept by up to £24 per year for a Band D property. This would raise an additional £7m. Pay no more than you pay now – a precept freeze. How is North Yorkshire Police funded? About 52 per cent of funding comes from the Government while the remaining 48 per cent is raised locally, mainly through the ‘police precept’ – the amount you pay for policing in your council tax. Our government funding is reducing year on year with continued reductions forecast for 2019/20. North Yorkshire Police needs to make savings of £10m each year from 2020. What do I pay now and what would an increase of £24, for a Band D property, mean to me? 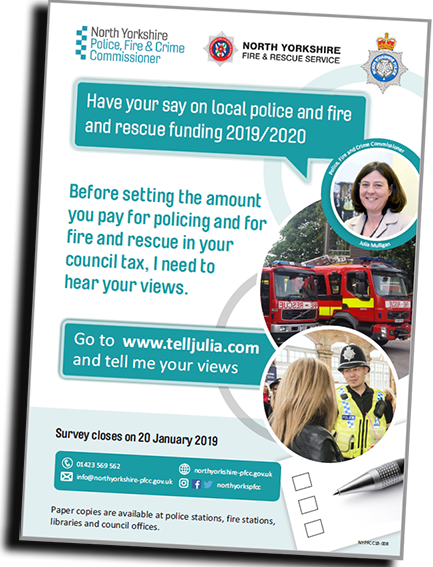 The North Yorkshire Fire and Rescue Service is facing serious financial challenges and Julia is determined to ensure it has a strong and sustainable future keeping North Yorkshire safe. The fire service currently attend around 6,500 incidents per year from fires to road traffic collisions, flooding to other emergencies. Our Fire Service needs to make savings of at least £3.5m each year from 2020 onwards. An average Band D property pays £69.20 per year for the fire and rescue service. The Government currently caps the amount of money Julia can raise by 2.99% or £2. This would raise an additional £600,ooo but will leave considerable financial challenges. This would mean a real terms cut to the fire and rescue budget when inflation is taken into account. Pay the same increase as last year – a 2.99% increase – an extra £2 per year for a Band D property. How is North Yorkshire Fire and Rescue service funded? About 30 per cent of funding comes from the Government while the remaining 70 per cent is raised locally, mainly through the ‘fire precept’ – the amount you pay for the fire and rescue service in your council tax. The North Yorkshire Fire and Rescue Service needs to make savings of £3.5m each year. What do I pay now and what would an increase of 2.99% mean to me?